Our visit to Groove Train in Richmond was unplanned. We had a reservation at restaurant down the road, but on arrival the entire smallish restaurant was dominated by one large loud table with 15-20 people on it. I don't mind large groups eating together, but it is a shame when they dominate a relatively small, normally fairly quite eatery. 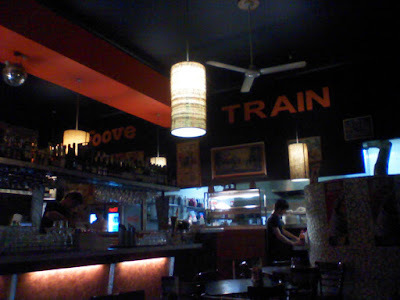 Anyway, onto Groove train, a modern exposed brick cafe/restaurant with a variety of dishes available, quite a few with an Italian origin. The staff were friendly and efficient, although that was easier for them as it was relatively quiet by the time we arrived around 9:30pm. I went for the roast vegetable pizza, which was huge! The roast veg weren't specified on the menu, and turned out to be aubergine and pumpkin. The pizza base was crisp and well cooked, the sauce was good, and there was a decent amount of veg. I also tried a bit of the lamb souvlaki, which contained decent chunks of lamb, wrapped with salad and felt relatively healthy! The overall bill with a few drinks was just over $50, so not cheap, but not bad either.